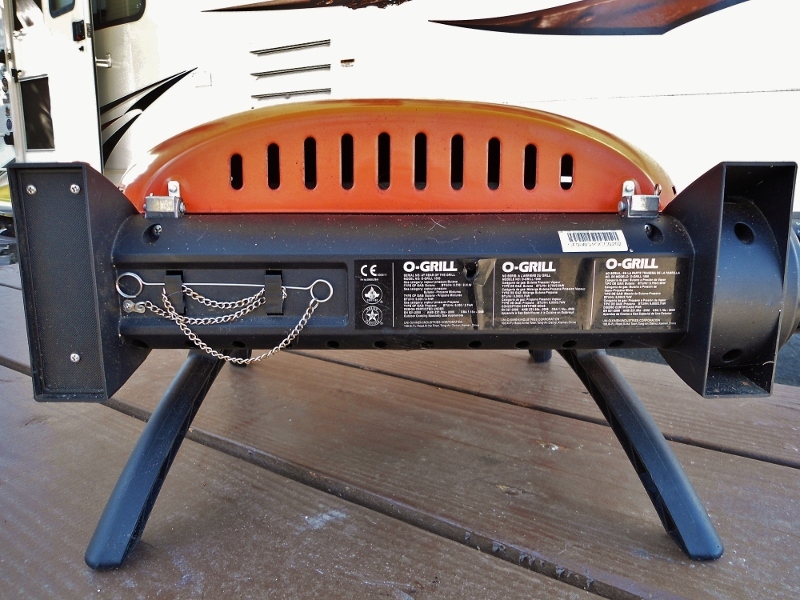 5 years ago when we hit the road as full-time RVers I needed to pick myself up a small portable barbecue grill. There was no way the huge old beast from the sticks and bricks patio was going to fit! 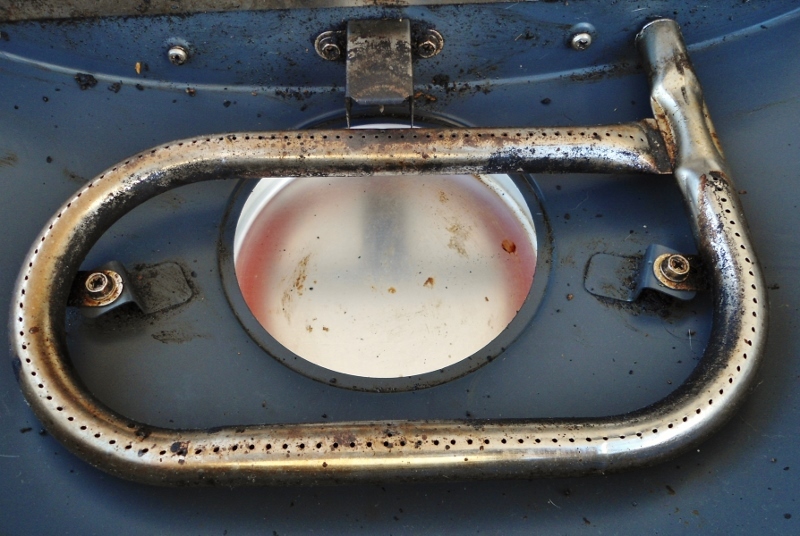 I had a Coleman gas stove from my campervan days which besides its regular stove type burner had a little grilling area. But, that was way too small for full time living, so the search was on. 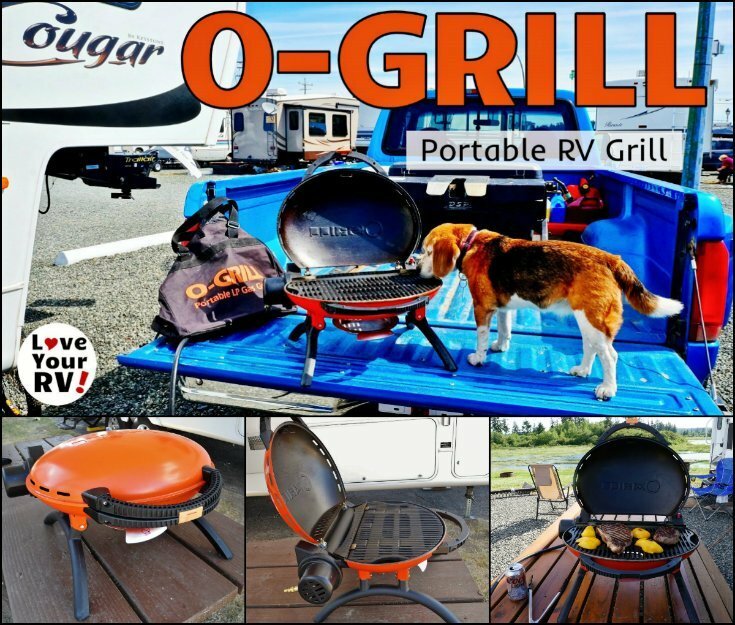 The first two I looked seriously at were the extremely popular Weber Q grill and the snazzy looking Coleman RoadTrip LXE. Both are nice grills with good reviews but unfortunately a little large. We are full timing in a 30-foot fifth wheel, space is precious. 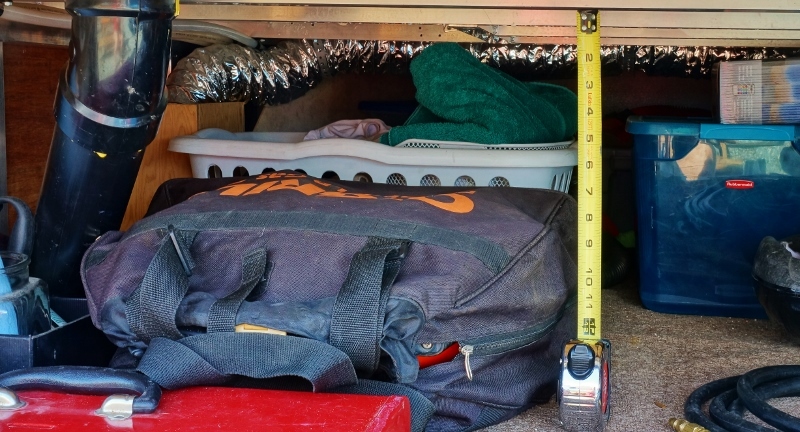 Furthermore, the basement pass through storage in our Cougar is only 16 inches high. The hunt continued as I looked for something a little more compact. While perusing the outdoor grilling isles of a massive Camping World store I spotted a funky UFO looking orange orb. 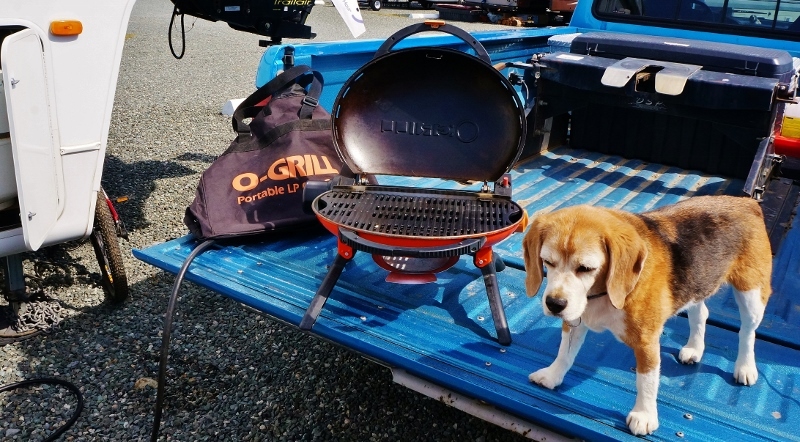 It was an O-Grill. Its sleek European styling was an instant hit with my artist minded wife Anne. 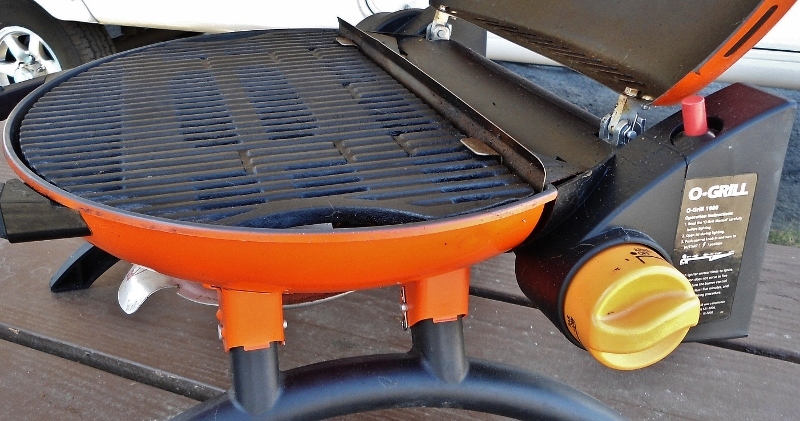 I was impressed by its compact, simple design and heavy cast iron grilling surface. It even came with a canvas storage bag. We were sold. 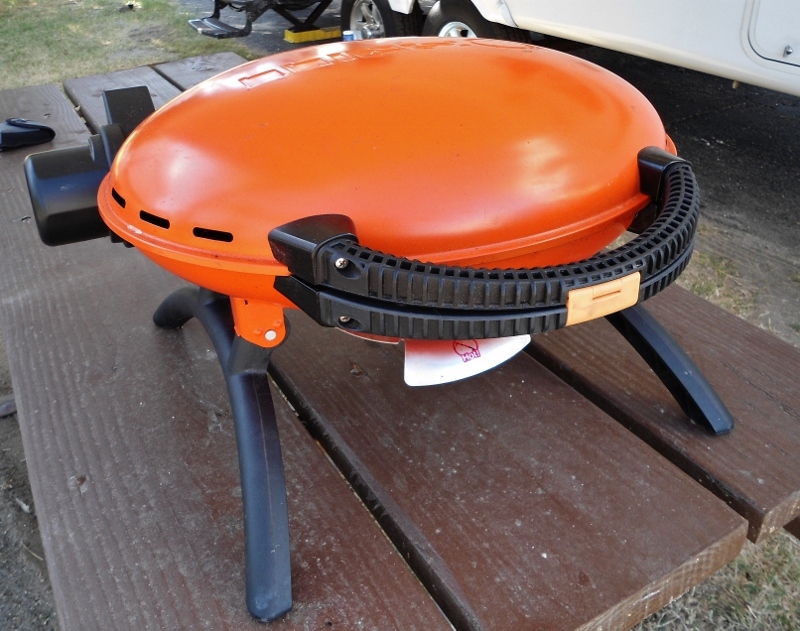 Since that day, the little O-Grill has helped me cook up hundreds of tasty barbeque meals. The heavy iron grill makes for a beautiful stripped sear on meats and very even cooking. 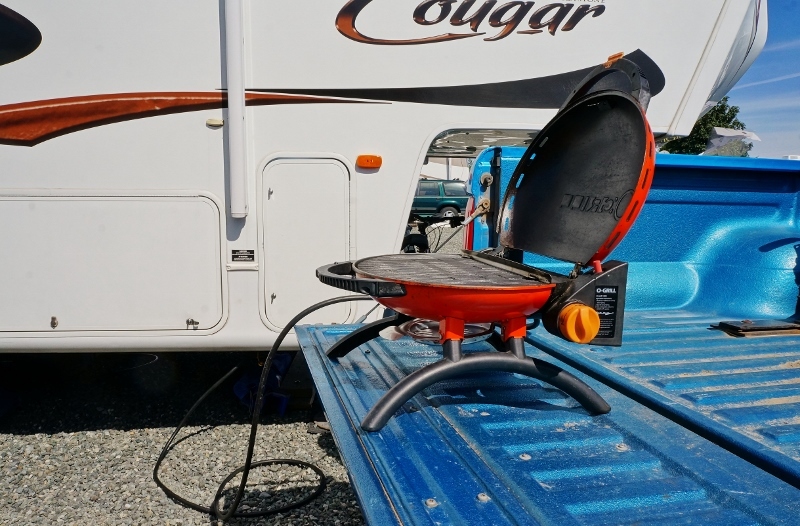 It’s a true tailgater as many times we are out boondocking sans any picnic table and the grilling is done right on the back of old Big Blue. For cleanup, I use a heavy wire brush on the grill then wipe out the insides. The burner can be popped out by removing a couple stainless screws. Because of the round design all the grease collects nicely in a removable metal drip pan underneath the body. 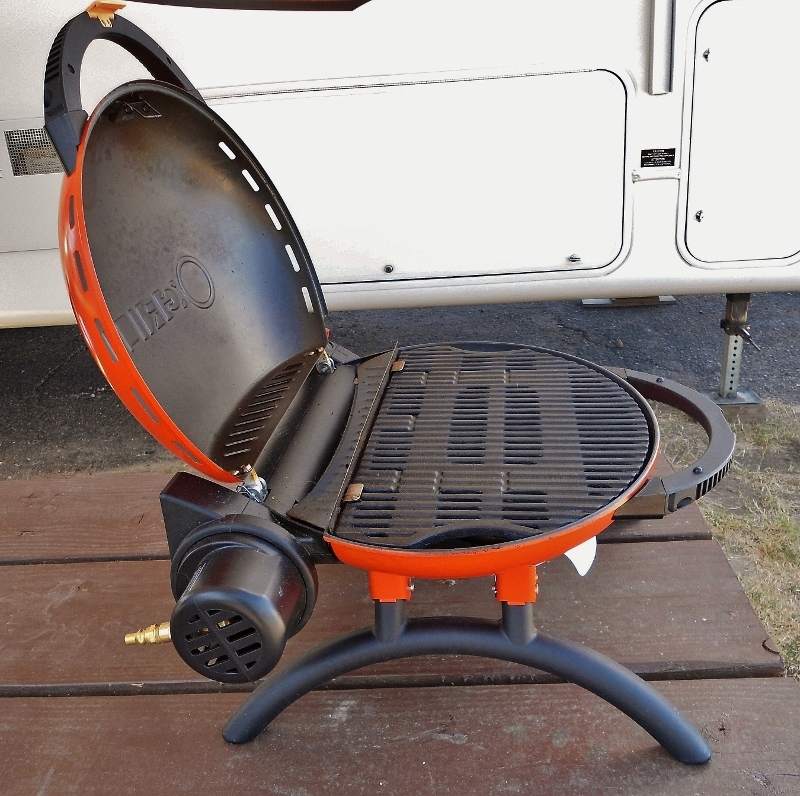 When not in use the legs can be folded down making the grill much more compact for storage. Easy on my back weighing it at only about 24 lbs. 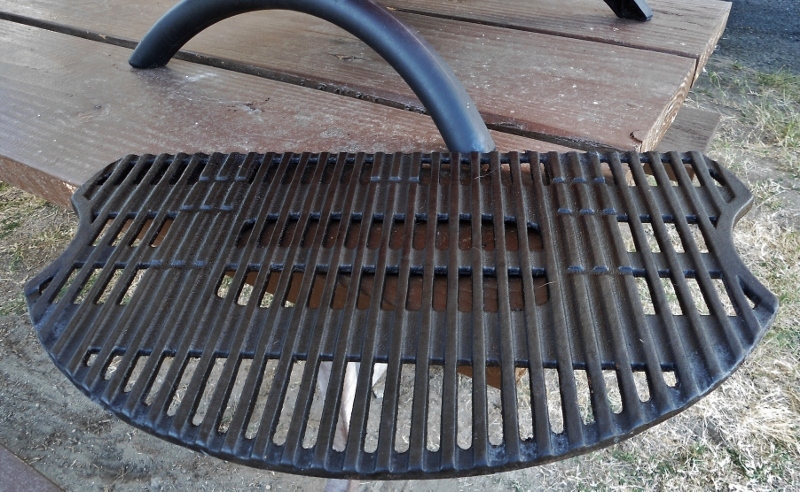 Heavy cast iron grill. Excellent to cook on. 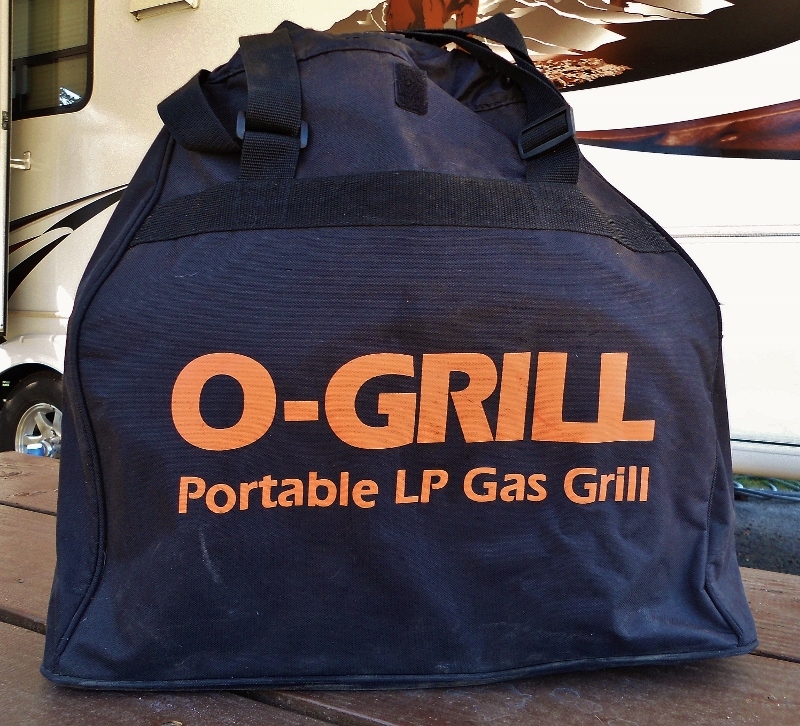 To make things super convenient and save on LP gas I’ve had the O-Grill converted for operation on the RV low-pressure LP gas system. 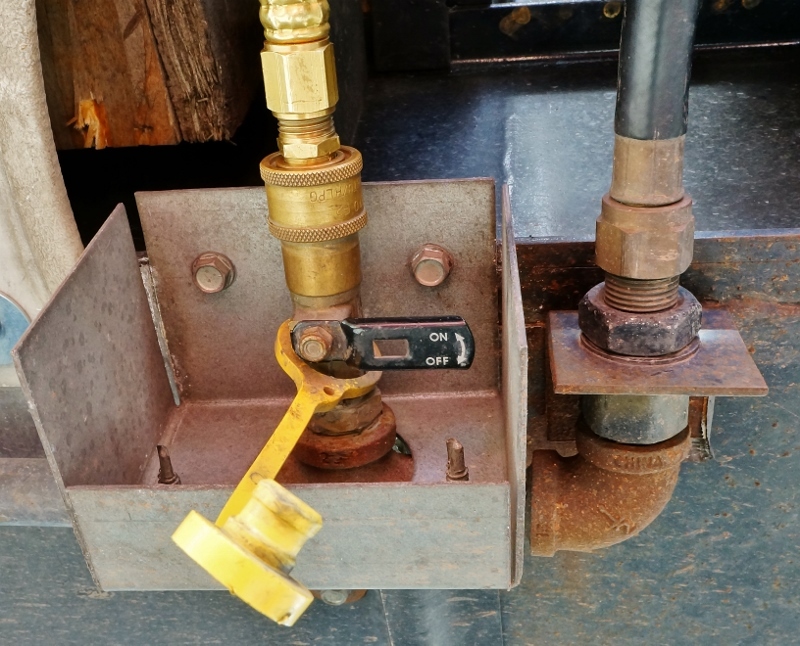 Our Keystone Cougar trailer came pre-plumbed with a regulated low pressure quick connect port. Very early on I paid a certified propane technician to convert the O-Grill to take advantage. 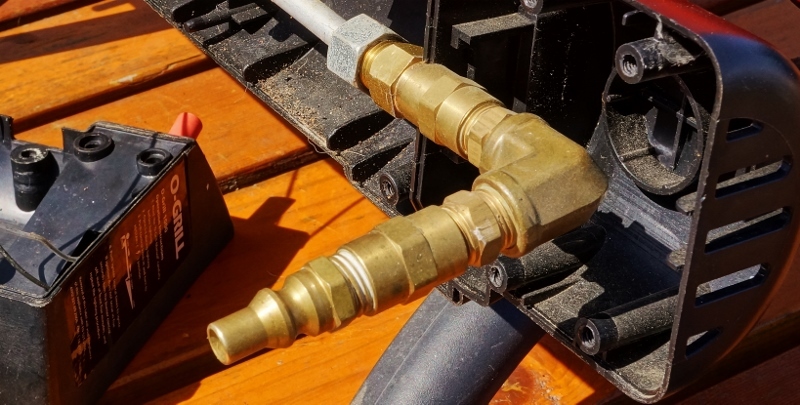 He removed the internal gas regulator from the O-Grill and added in the appropriate fittings in place of it plus a brass male quick connect port. 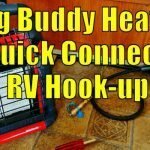 I then had him make up a 15-foot rubber LP gas extension hose with two quick connect fittings. Now I just deploy my O-Grill and with two quick connections I’m good to grill! 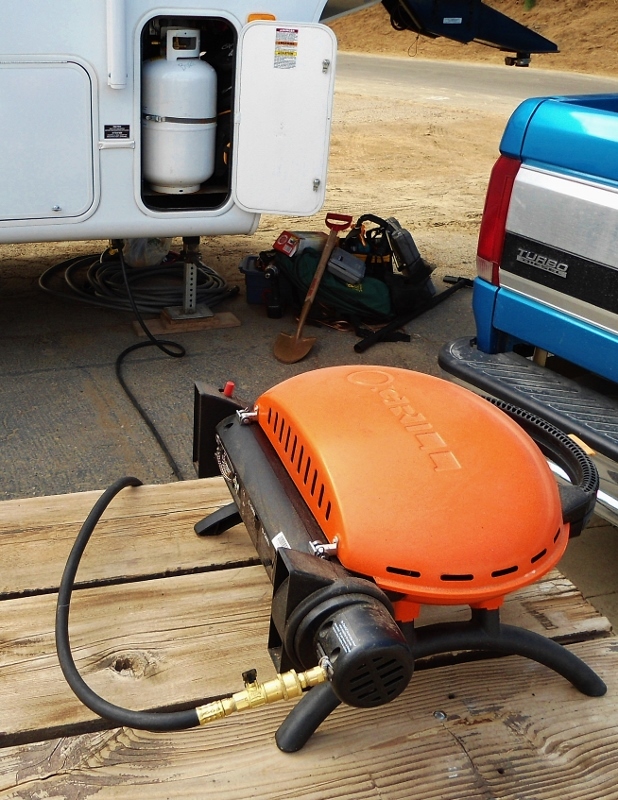 Even though the low-pressure output is only 1/2 PSI it still provides plenty of cooking heat. 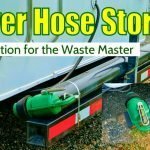 It saves a lot of money over using the little green compact propane canisters and is safer than using a high-pressure hose connected to a separate large propane cylinder, plus I don’t have to pack it around. Of course, I’ve lost the ability to use it with those things but I have my old Coleman camping stove to take along on day trips without the rig. 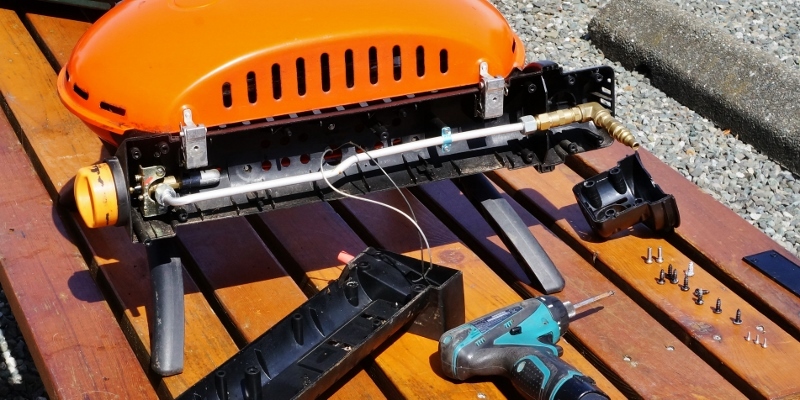 Caution: If converting a portable barbecue like I did be aware of all risks and consult a propane professional. 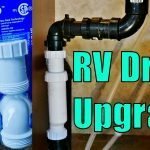 Be aware you are also likely voiding your product warranty. 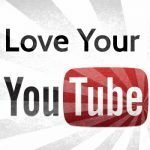 This post should not be taken as instructional. So with nearly 5 years under its belt, my trusty little O-Grill looks to have heaps of life left in it. 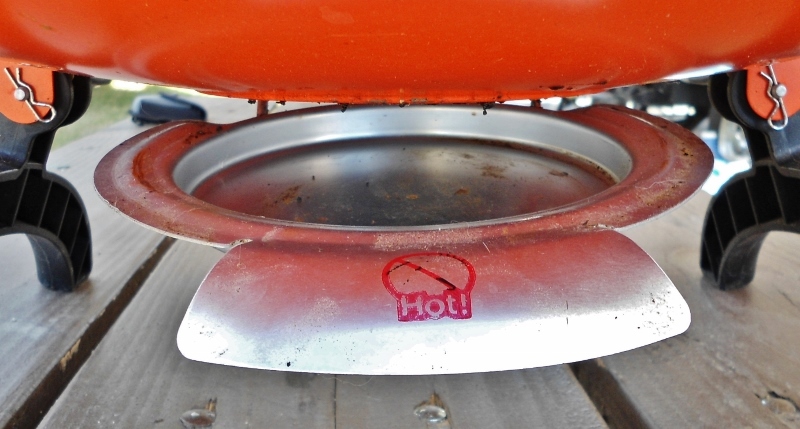 There is very little sign of corrosion to the body, grill and burner. It performs as well if not better than new since the cast iron is now so seasoned. 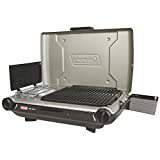 I highly recommend it to anyone looking for a compact barbeque grill for their RV. 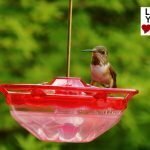 Two Love Your RV! thumbs up.